< *'''["Puerto Rico"]''': I finally played this game at SeattleCosmicGameNight20030215. I didn't quite see what the fuss was about, but it definitely deserves another play, maybe after I've read the rules for myself. > *'''["Puerto Rico"]''': I finally played this game at [[SeattleCosmicGameNight20030215]]. I didn't quite see what the fuss was about, but it definitely deserves another play, maybe after I've read the rules for myself. Please feel free to fix any errors you find on this page. 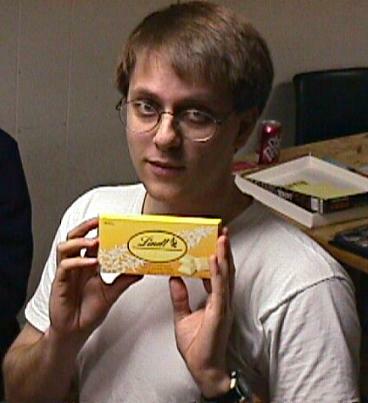 Paul exhibits his prize for winning a game of Chrononauts at the Game Night held on November 15th, 2000. Chrononauts: A card-based TimeTravelGame from Looney_Labs? Guillotine: A fun little Wizards_of_the_Coast? venture. Robo_Rally? : Continuing thanks to Ron_Hale-Evans? and Marty_Hale-Evans? for getting me this favorite from my college days. Wizard: A slick packaged version/variant of Oh_Hell?. I'm dismal at it, but nostalgic for it. I'm pretty sure Ron_and_Marty? got me this, too. They Rule. Elfenland: Not a bad little game. Simply_Cosmic? : My first experience with Cosmic_Encounter? and the Seattle Cosmic equivalent of a gateway drug. Mutant_Chronicles? : If I ever return to Seattle Cosmic on anything like a regular basis, I'm going to push for a couple rounds of this. The_Great_Dalmuti? : Another college favorite. Some people despise this game, but they're peons so who cares? Mad_Scientist? : Do not purchase this game under any circumstances. Mancala: The original Farming Game. Origins? : A Trivial Pursuit wannabe all about word and phrase etymology. I have yet to play it. Netrunner: Just a starter deck and a couple of boosters that I won as prizesback in the early days of Seattle Cosmic. Maybe this list should be on BoardgameGeek, and maybe someday it will be. Twilight_Imperium? : Quite fun but takes a ghastly amount of time to play. Samurai: By Knizia. I'd be interested to see how a game with three or four players goes. Fluxx: Just about anyone should be able to enjoy this simply card game from Looney_Labs?. Puerto_Rico? : I finally played this game at SeattleCosmicGameNight20030215. I didn't quite see what the fuss was about, but it definitely deserves another play, maybe after I've read the rules for myself. Myth_Fortunes? : I hope it has made up quotes in it, like in the books. Meredith_Hale? owns this and we've always meant to play it together. Cities_&_Knights? : Along with all the other Settlers_of_Catan? expansions and spinoffs. Space_Hulk? : Now we sing the Litanies of Hate. Tigris_&_Euphrates? : Actually, I play rather a lot of this, but all online at Boardgame``Geek (see below). Due to one thing and another, I don't make it to Game Night as often as I used to. However, I still subscribe to the list and read the newsletters in order to keep up with the latest controversies, and of course I edit the Wiki. To keep the logic and strategy centers of my brain from weakening, I play OnlineGames with members of Seattle Cosmic. Here are the sites I frequent far too, um, frequently. ItsYourTurn: A free (as in loader) site that offers a wide range of games, including ancient classics such Chess, Checkers, and Go; and a few other well-known games under new, trademark-skirting names like "Stack-4" and "Battle Boats". The site also features a few variants for nearly every game. These games, like the rest on this list, are non-real-time, so they take a long time but users can make moves in just a few seconds a day. As with the other game sites, I short-circuit this feature by joining numerous games at once. BoardgameGeek: In addition to its game descriptions, reviews and a Seattle-Cosmic-inspired Wiki, Boardgame``Geek features two online games, Tigris_&_Euphrates? and Auf_Heller_und_Pfennig?. A third game, Goldland? is in the works. These games are for 2-4 players, unlike Its Your Turn, which only has two-player games. My college friends turned me on to this site and I'm doing my best to pull in members of Seattle Cosmic. Ludagora: This is a French gaming site, so keep an online language tool (or your own brain) handy. It offers the games Hare_and_Tortoise?, Medina?, Set, and Crazy_Circus?. One drawback, apart from the language barrier, is the lack of a method to password-restrict games as you can on Boardgame``Geek (this has now been remedied, at least for Hare and Tortoise). If you post a game, anyone can join, and most of the people who are going to want to join are offset by 9 timezones. This leads to large delays in the games, and might mean that slot you intended for a friend is taken up by a stranger.